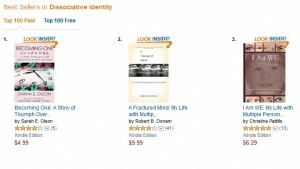 I am the author of 'Becoming One: A Story Of Triumph Over Multiple Personality Disorder', and have maintained an online presence since 1993. Each Friday, I post 'Best Tweets for Trauma and PTSD Survivors', an annotated compilation of links tweeted in the previous week. I also maintain the Dissociation Blog Showcase, an index of ~180 blogs which discuss dissociation primarily from a personal experience perspective. Having survived a violent, secretive childhood, I know the craving for security, love, and hope that is so often missing in adult survivors' lives. I understand feeling crazy and continually misunderstood. I also know how hard it is to find help to move beyond the pain and daily challenges of trying to put a different life together. What I've learned over many years is that there is always hope. Always. My premise is that 'becoming one' is an ongoing process that is always coming into shape and focus. And it always requires diligence, honesty, and integrity to make it real. It's a journey that does not have to be done alone, either. There are hundreds of great resources for trauma survivors and their supporters, many of them organized by category on my website. Be proactive, and be your own best advocate.